The rulers of Byzantium were accustomed to blinding their rivals. With ornamental eye scoops, with daggers, with candelabras, kitchen knives, and tent pegs, with burning coals and boiling vinegar, with red-hot bowls held near the face and with bandages that left the eyes unharmed but were forbidden to be removed; sometimes it was sufficient merely to singe the eyelashes, for the victim to bellow and sigh like a lion as a trained executioner pantomimed the act. Sometimes cruelty was intended beyond the enucleation itself, as when the emperor Diogenes Romanus was deposed and “they permitted some unpracticed Jew to proceed in blinding the eyes” and “he lived several days in pain and exuding a bad odor.” In 797 the empress regnant Irene blinded her son Constantine VI and caused an eclipse that lasted seventeen days. Basil II blinded fifteen thousand Bulgarian soldiers, and every hundredth man he left with one eye to lead another ninety-nine, and when these men returned home to their king Samuel he looked upon them and died. Michael V blinded his uncle John the Master of Orphans. The iconoclasts blinded the eyes of the icons. -from "Byzantium: Their Ears were Uncircumsized"
Last week, Charles Stross publihsed a blog post that talked about how publisher-mandated DRM was handing a big ol' hammer to Amazon by allowing it to lock users into the Kindle. This week, TOR announced that it's going DRM-free, and other major publishers are about to follow suit. Will this save traditional publishing? Not by itself, but it's a good next step. It looks like Charlie isn't just a good science fiction writer, he's also a savvy business strategist. Returns fell after the dotcom bubble burst in 2000, and now the industry average tracks the broader equity markets. Here, Noah Smith discusses some of U Chicago Professor Steven Kaplan's research on the matter. The upshot: there's alpha to be found among the VC's, but it's really hard to be one of those positive alpha fund managers. The addition of more funds just results in lots of really bad funds with negative alpha. There's another possible reason, having to do with the rationalization and increased liquidity of the early stage tech market, but that wouldn't account for the persistently good returns of the top funds, so the alpha theory seems to have it. 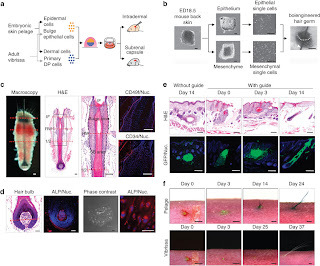 Scientists have grown human hair follicles on the back of a hairless mouse, using tissue engineered pelage and vibrissa cells from stem cells and differentiated tissue. I've always said that organ regeneration would be achieved by vanity before necessity, and that hair replacement techniques would finance the development of full organ stem cell techniques. Among the deserving winners of this year's Pulitzer Prizes is Craig F. Walker, for his series of photographs of Scott Ostrom, an Iraq War veteran dealing with the symptoms of PTSD. The war is still with us. This is one of those little web projects that everyone links to, because it's beautiful and informative. 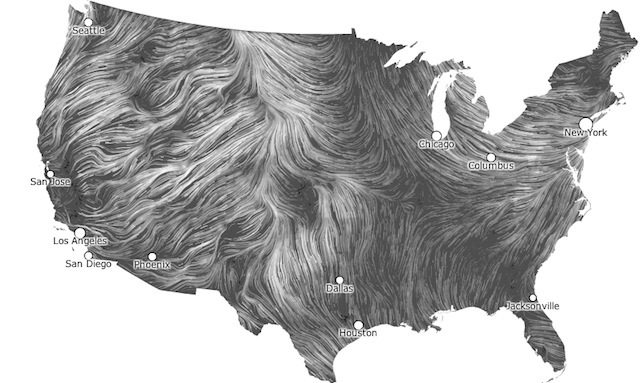 It's an animated map of the wind, using data from the National Weather Service and animated by a couple of Googlers. Delicious banjo music in a rundown New York building. CISPA is SOPA, but for "cybersecurity" rather than "anti-piracy". Either way, it's no darn good, so get on the phone. Google has all your information for sale. We're in the middle of a blind spot in time, and everyone's mad about it. Science fiction's move toward the present leaves a lack of inspiration for real-world innovators, as Neal Stephenson noticed. Russell Davies sees it in fashion, too, in all that military-derived heritage wear. NASA can't launch a man into space, let alone the moon, anymore. Neil DeGrasse Tyson weeps for the future. Is this a Great Stagnation, or are we just having an idea breather before coming up with the new New New Thing? Well, Chairman Bruce thinks these New Aesthetic kids have caught onto something, with their See Like a Machine, pixellated reality follies. It's the opposite, or maybe just the next iteration of the blobject; it's the incursion of mobile screens into the 3D world. James Bridle is the theorist, or maybe just the blogger, behind the movement, but the core inspiration is Minecraft. 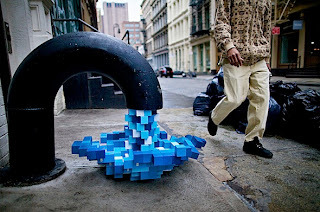 Will we be wearing 8bit pixelpunk clothes to our New Aesthetic get-together at the next SXSW? Who knows. I just like the bright colors. It’s contemporary. It’s temporal rather than atemporal. Atemporality is all about cerebral, postulated, time-refuting design-fictions. Atemporality is for Zenlike gray-eminence historian-futurist types. The New Aesthetic is very hands-on, immediate, grainy and evidence-based. Its core is a catalogue of visible glitches in the here-and-now, for the here and for the now. It requires close attention. If you want to engage with the New Aesthetic, then you must become involved with some contemporary, fast-moving technical phenomena. The New Aesthetic is inherently modish because it is ferociously attached to modish, passing objects and services that have short shelf-lives. There is no steampunk New Aesthetic and no remote-future New Aesthetic. The New Aesthetic has no hyphen-post, hyphen-neo or hyphen-retro. They don’t go there, because that’s not what they want.